If you’ve been following my posts here on ReviewNaija, you would know I love awoof. I totally enjoy discounts and deals, so, I’ve made dealdey my best friend. Even though I’m subscribed to their newsletter, I still check out their site regularly with hopes of finding something I like. 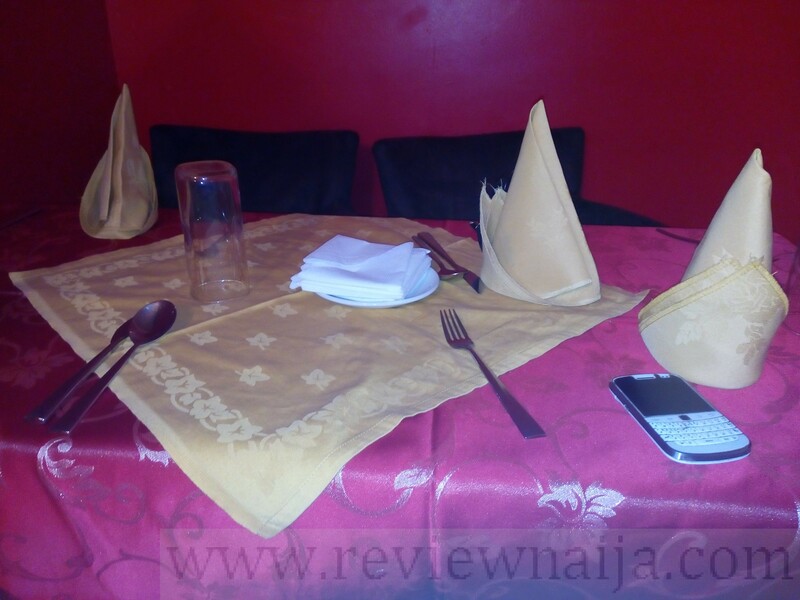 Recently I checked out the site and came across a 3 Course meal at Rodizzo Restaurant and Bar, Ikeja for 3,450 Naira. I was pretty impressed. I paid for the deal, as a treat to myself, and called Rodizzio to make a reservation for 1 for 4pm on a Saturday. On said day, I called once again to confirm my reservation because I can’t stand awkward situations. 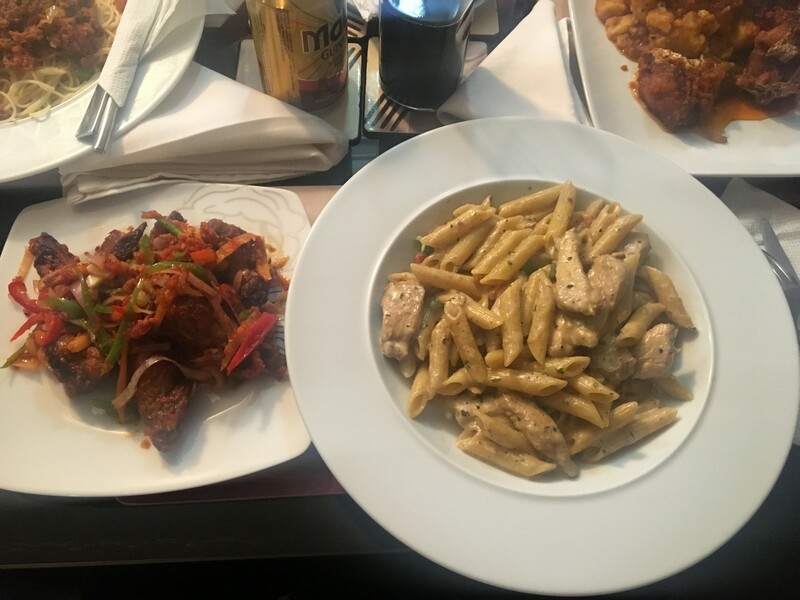 My reservation was confirmed and I headed to GRA, Ikeja for Lunch. It wasn’t difficult locating Rodizzio as it is located in the heart of the very popular Isaac John Street. I was ushered in by a very courteous security guard. There’s parking within the compound for about 12 cars. Anyway, I found my way to the dining area. I’d forgotten to print out my dealdey slip so I had to speak with a manager to clear things up before being seated. AMBIANCE/DÉCOR – I think Rodizzio’s décor is just there. There is really nothing over the top, just a red background with several tables and chairs. There are 2 floors; upstairs is a bar, and downstairs is the restaurant (side note, smoking is only allowed at the bar). There is a secluded VIP section and that was where I got to eat as the main dining hall was noisy (thanks to the birthday lunch party!). 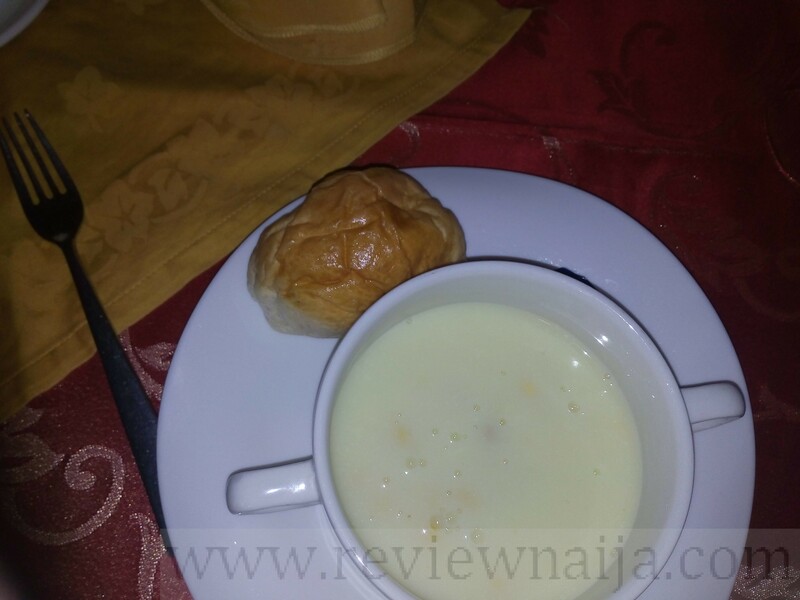 FOOD – About 10 minutes after I was seated, I got my first course which was cream of chicken soup, with a bread roll and butter. The soup had chicken, sweet corn and some additional ingredients I totally enjoyed. My entree was the Rodizzio Jambalaya. Now, when they brought this meal I was wondering how many people were eating because it was quite much. 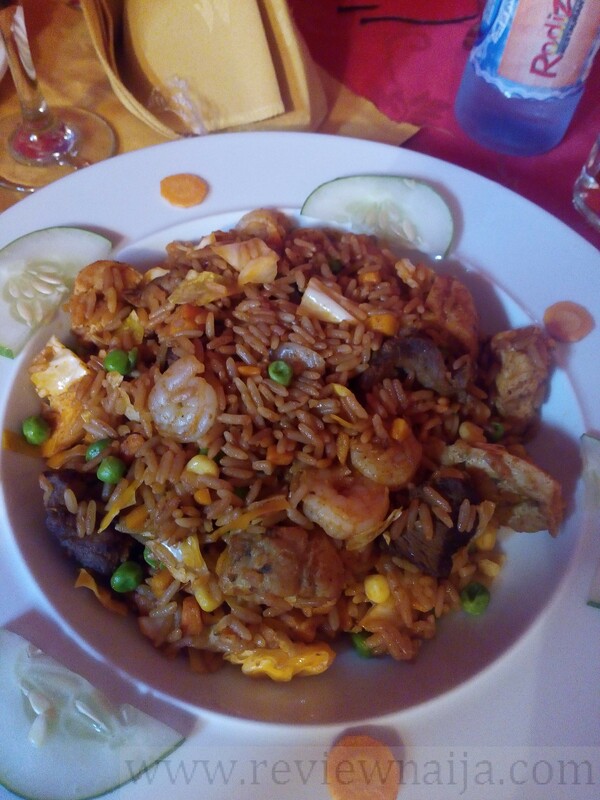 It contained some seafood, beef , chicken, all chopped in tiny bits into the Jollof rice. I couldn’t finish the jambalaya, and I really tried to. I just got really tired and my mouth felt too weak to chew. But, it was really good. Thumbs up to the chef. 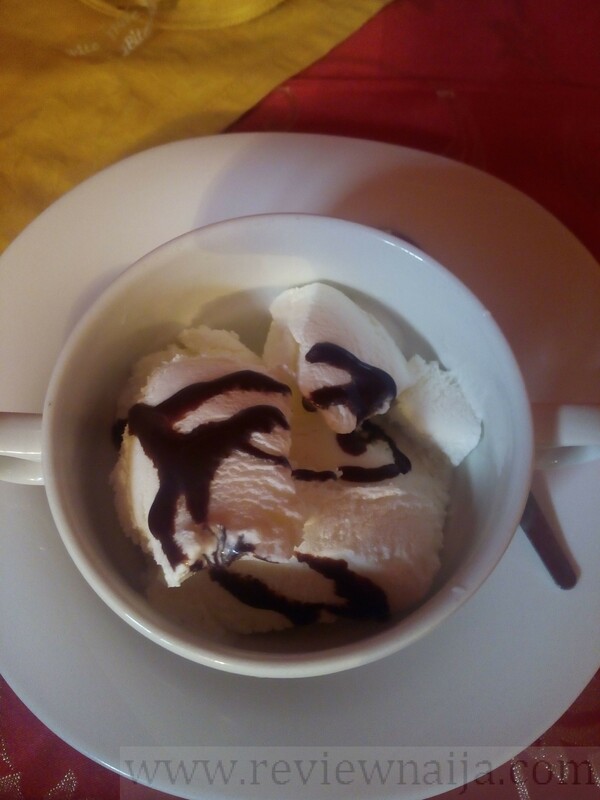 Dessert was vanilla ice cream with chocolate sauce and I had to create space in my stomach for it, as it looked very inviting. I don’t know if the ice cream was made in-house or not, but I really loved it. I liked the fact that the chocolate used tasted like very rich dark chocolate, vs. regular industrial chocolate. 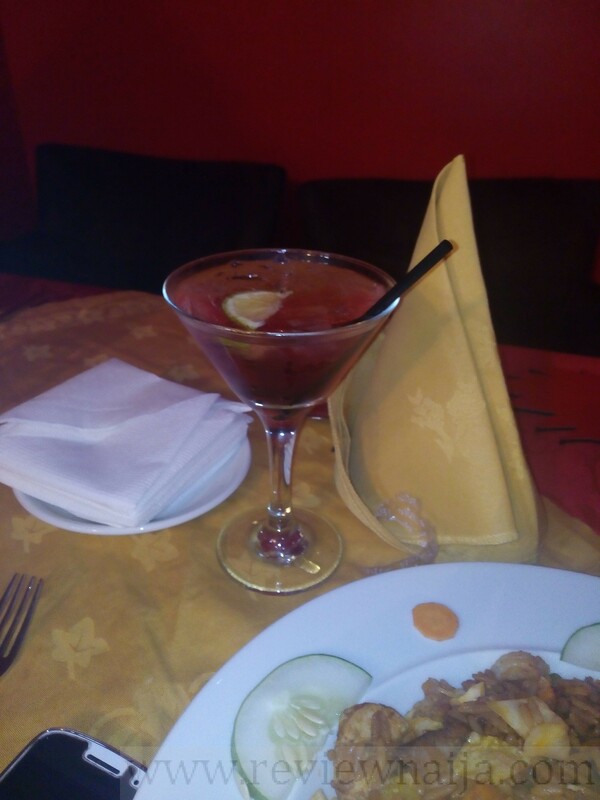 DRINKS – The deal didn’t include drinks, but I was in the mood for some strong alcoholic beverage so I ordered a Cosmo. Apparently, it’s made of Vodka, Cranberry Juice and Lime Juice, or at least that’s what I tasted. This was my first cosmo and I loved it! The cosmo cost 1,500 naira. 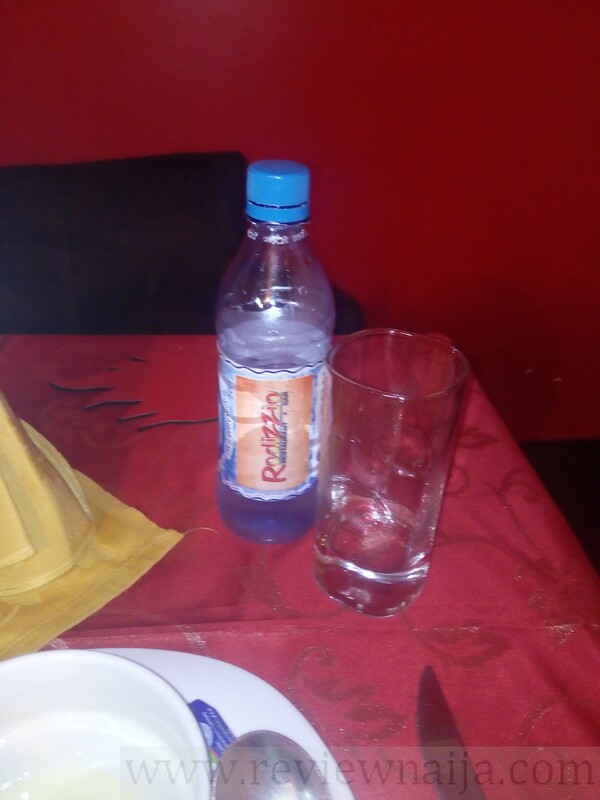 I also ordered a bottle of water which cost 200 naira. SERVICE – The staff was friendly, my waiter was very attentive, and I even had a lengthy discussion with the Manager, who happens to be from my state! Although I had to look for my waiter about once or twice, I totally understood because there was a large crowd for the birthday lunch and it seemed like an all hands on deck type of situation. RATING – I will rate Rodizzio an 8 over 10. I enjoyed the food and the service, but I was pretty disappointed because the POS didn’t work. I mean, we are in the Cashless Naija era!! I had to go outside to the nearest bank to withdraw money. I also think Rodizzio should consider redecorating their space (including table setting) – it looks a little olden days-ish. I noticed the name change I kept on asking the waiter if it was rodizzio before until he said yes but they don’t usually disclose it. Perhaps they had some management issues and the rodizzio I knew before used to be a different building. The service was so slow and we were the only ones in the restaurant that day on a Friday evening around 7pm. The food was reasonably priced I had Alfredo pasta it was nice. But overall I wouldn’t go there again it has a dull atmosphere. Lol well sounds nice, might try it sometime. you should lol. its very nice.. btw ur blog is beautiful. This is amazing…. 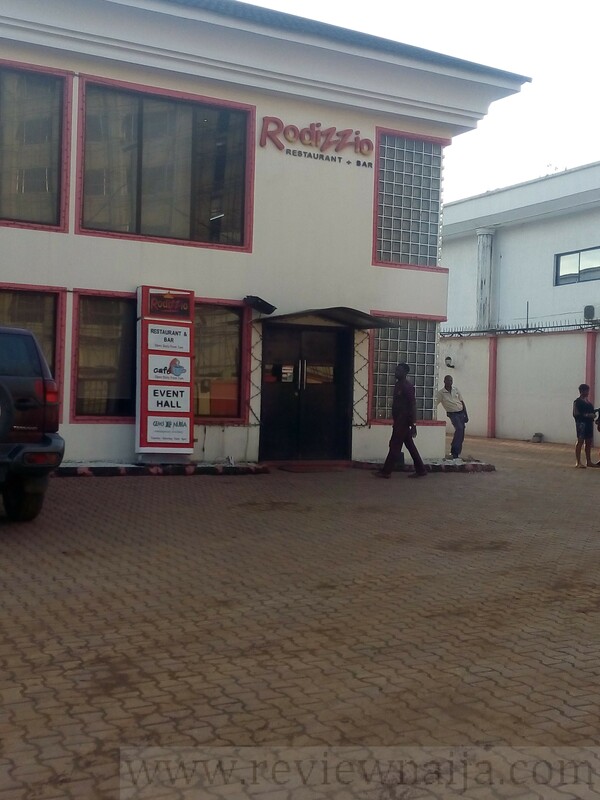 Well i haven’t be there but i have a seminar at Ikeja tomorrow Dec,06th and would definitely visit Rodizzio to check it out and have a taste of your review. Special regards to REVIEWNAIJA great job, Your reviews are awesome and actually makes lot of people know so many cool chilling hangout spots, Lounges and restaurant where someone can have fun, relax with friends and family etc. Hmmm yummy! Nothing feels better than being pampered like this.I will love to visit this place on or b4 xmas.hope they have my type of food in there menu.